Little, Brown Books for Young Readers, 9780316013727, 40pp. 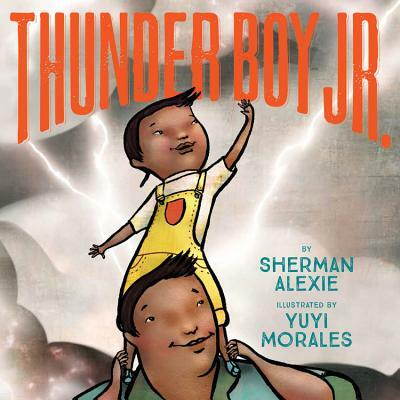 From New York Times bestselling author Sherman Alexie and Caldecott Honor winning Yuyi Morales comes a striking and beautifully illustrated picture book celebrating the special relationship between father and son. Thunder Boy Jr. wants a normal name...one that's all his own. Dad is known as big Thunder, but little thunder doesn't want to share a name. He wants a name that celebrates something cool he's done like Touch the Clouds, Not Afraid of Ten Thousand Teeth, or Full of Wonder. But just when Little Thunder thinks all hope is lost, dad picks the best name...Lightning! Their love will be loud and bright, and together they will light up the sky. A National Book Award-winning author, poet, and filmmaker, Sherman Alexie is one of the most well-known and beloved literary writers of his generation. His works of fiction, including The Absolutely True Diary of a Part-Time Indian, Reservation Blues, and The Lone Ranger and Tonto Fistfight in Heaven, have received numerous awards and citations. He lives in Seattle. Like Thunder Boy Jr., Sherman was named for his father. Since migrating to the United States from Mexico in 1994, Yuyi Morales has created some of our most celebrated children's books, including Niño Wrestles the World, Harvesting Hope: The Story of Cesar Chavez, and many others. She is the winner of several awards, including a Pura Belpré Medal and a Caldecott Honor for Viva Frida. Yuyi divides her time between Mexico and California.